Item 2: Information note on the transactions concluded with the administrators or directors, with the employees, shareholders who own the control of the company or a company controlled by them in compliance with art. 52 paragraph (3), letter a) of OUG 109/2011 with the subsequent amendtments and changes throughout 01.05.2018 – 01.07.2018. Item 3: Information note on the transactions concluded with the administrators or directors, with the employees, shaholders who own the control over the company or a company controlled by them, in compliance with art. 52, paragraph (3) letter b) of of OUG 109/2011 with the subsequent amendtments and changes throughout 01.05.2018 – 01.07.2018. Item 4: Information note on the implementation of the Regulation 2016/679 (GDPR-The General Regulation on data protection) within SN Nuclearelectrica SA. Items 2, 3 and 4: The approval of the revised form of the Strategy to continue the Project with the acknowledgement of the phases unfolded thus far, including those unfolded based on the provisions of the Government Memorandum no. 20/12683/MB dated July 13, 2017 and on the provisios of the subsequent mandate granted to the SNN BoD through GMS resolution no. 6/24.08.2017, with a view to: a) Reorganize the negotiation/approval stages and terminate the activity of the designated commissions (the Negotiation Commission and the Interministerial Commission), the negotiations being conducted by a negotiation commission appointed by the executive management of SNN;Modify art. 8.14 in the sense that the Investors’ Agreement and Articles of Incorporation project of the JVCo will be subject to the approval of the SNN GMS within the limit of competences and attributions. 3. The mandating of SNN BoD to establish the terms and conditions to continue the negotiations in order to allow the set up of a mixed company project (“JVCo”) with CGN as well as to implement the revised Strategy in compliance with the above mentioned item. 4. The approval to continue the negotiations on the Investment Documents under the same conditions of the Memorandum of Understanding for a 6-month period since the date of the corporate approval in compliance with all the other provisions of the MoU, including the possibility for either party to terminate the MoU without any compensation through a simple notification to the other party case be an agrreement on the Investment documents cannot be reached and the delay is not caused by that party. Item 5: The approval of the Strategy to implement the “Cernavoda NPP Detritiation Installation” investment project based on the Feasability Study, revision 11. At item 5 on the EGMS agenda, SNN published the Note subjected to the approval of the General Meeting of Shareholders regarding the Strategy for the implementation of the investment project “Tritium Removal Facility at Cernavoda NPP” on the basis of the feasibility study, revision 11. In regards to the information presented in the Note, SNN understands to protect its legitimate commercial interests by deciding not to disclose at this time the relevant technical and financial data relevant to the Feasibility study rev 11, the disclosure of which may negatively affect the application of the strategy and the related procedures. Understanding, in the context of the applicable legislation, the rights of the shareholders to have access to sufficient information about the issues subjected to the approval of the GMS, SNN whishes, in the spirit of transparency, good faith and best practices, to offer the shareholders the possibility, in compliance with the requirements provided in the Convening notice, including the requirement to own SNN shares on the reference date 10.08.2018, to address a written request for information, in Romanian or in English, accompanied by the Confidentiality Agreement for legal persons(click here to view)/ Confidentiality Agreement for natural persons (click here to view), in order to receive the executive summary of the feasibility study regarding the Tritium Removal Facility which is the foundation of the strategy proposed to the shareholders. 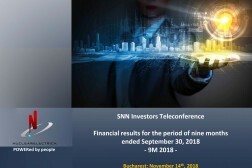 The requests, accompanied by the signed Confidentiality Agreement will be sent to the attention of the SNN Board of Directors , either in physical format, submitted at SNN Registration Desk, 65 Polona Street, during 08:00 – 16:00, either online, with included extended digital signature as per Law no. 455/2001 at the email address aga@nuclearelectrica.ro, with the title “Request for documents GMS 22.08.2018”. 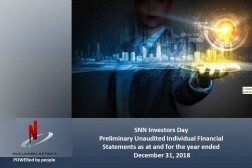 SNN will perform the necessary verifications in order to determine the capacity of SNN shareholder on 10.08.2018, in the shareholders registry sent by Depozitarul Central and will make available a copy of the executive summary of the feasibility study regarding the Tritium Removal Facility at Cernavoda NPP, starting with 15.08.2018, until the GMS on 22.08.2018. A copy of the executive summary of the feasibility study will be made available for pick up from SNN registration desk, 65 Polona street, during 08:00 – 11:00 for the requests received in physical format and electronically, by email, with SNN extended signature incorporated, for the requests received by email. Items 6 and 7: Information note on the result of the comparative analysis between installing U3O8 powder processing line at FCN Pitesti and overtaking the processing line from CNU Feldioara. 7. The approval to mandate the BoD to perform a due diligence analysis (technical, environmental, financial, legal) with a view to a potential overtaking of the processing line from CNU Feldioara Sunsidiary.